We have not seen the last of El Niño. Episodes of heavy rain and winds will likely continue over the next few months. If your landscape on a slope, there are some actions you can take now to prevent the damaging effects of erosion. Its effectiveness depends on height of your slope and how securely it is staked to the slope. Material is biodegradable. If appropriate for your slope, it can help to protect from wind and storm damage. The plants listed below are just a few ideas of plants that are hearty enough to help stabilize your slope. Keep in mind that the needs of each environment will vary depending on sun exposure, wind, temperature and soil. 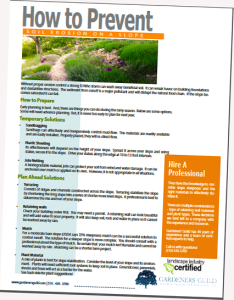 Download Our Guide to Preventing Erosion! It includes more detailed information and list and photos of plants with tips on maintaining them. Very valuable information for all property owners to have. The best time to address erosion and drainage issues is prior to the rainy season. Storm water management requirements have become much more stringent through the years and carry substandard penalties if not carried out to code.